In the case of The Caravaners from 1909, perhaps a pseudonym was useful, since its humour depends on a really vicious caricature of the pre-First World War Prussian military caste. However, since von Arnim had been married to one of these Prussians for nearly 20 years when she published the novel, it has to be assumed that she knew what she was writing about. Her husband was a member of the German aristocracy whom she named the Man of Wrath in her earlier novels, based on their life together, so that might not have gone down too well at home. The Caravaners is largely set in England, the first time Elizabeth had done this in her fiction, and is also told in the first person, and by a man, two more new things. Her narrator is a stout, middle-aged, pompous, arrogant, lazy, vain and judgemental Prussian man. Almost all her novels are told by or through a woman, who is someone sympathetic or at least someone we can feel empathy for, with whom the reader is expected to identify. 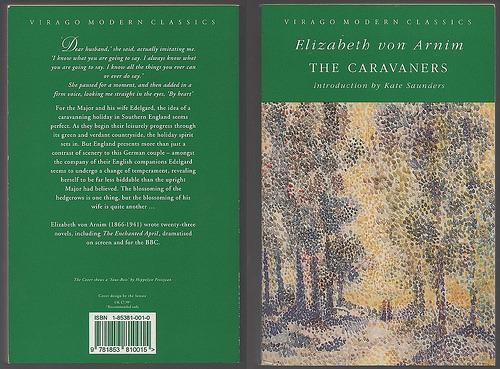 There is no way in human nature that anyone could sympathise with the narrator of The Caravaners, Baron Otto von Ottring, and yet this is one of von Arnim’s funniest, most entertaining, and secretly delightful novels. How so? Here’s the plot. Baron and Baroness von Ottring are persuaded to take a wandering caravan holiday in England with a widowed German friend (with whom the Baron is rather taken), her sister and the sister’s English husband, and one or two other English people. The von Ottrings arrive in Kent after a rocky Channel sea crossing, meet the party, and are introduced to their new home for a month, a very small wooden caravan which is to be drawn by a horse. Baroness von Ottring, the very attractive Edelgard who is much younger than her pompous husband, is enchanted with the dinkiness of the caravan and all its clever arrangements, but the Baron is taken aback by the fact that he is now expected to cut wood, make fires, cook food, wash up, and walk all day leading the horse, in all weathers. Naturally this is impossible for an officer and gentleman, as well as for a Prussian gentleman, whose women will naturally do all the work, so he avoids as much work as possible, and waits for the Baroness to do the rest for him. He is also taken aback by the English people in the party. One of these is a socialist Member of Parliament, and another is a Church of England minister. He quite rightly ignores or is haughty to the minister, for this is how good Germans treat their pastors, who are of no social account, until he is told that the minister is actually a Lord, and the son of a Duke, which naturally changes everything. With such cultural clashes and simple failures of understanding the party survives for one whole week, until the Baron’s personality, opinions, attitudes to class and the cooking of supper, and general rudeness, drive everyone away. This is very annoying as the Baron had paid for a month of caravaning and is offended to not get full value for his money. 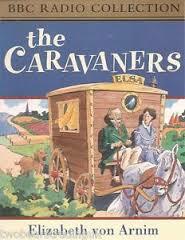 I think the main reason The Caravaners is so funny is because it is narrated by someone who loathes caravaning. I had many caravan holidays in my childhood, for which we were grateful since there wasn’t much money to have a more lavish holiday, but I do not wish to have a caravan holiday ever again. The essential misery of the caravan holiday is captured brilliantly in this novel. Yes, the fittings of the caravan are delightfully compact and convenient, but the walls are thin, the bunks are tiny, and hard, the floor slopes at a different angle and gradient each night, depending on which part of the turnip field you are in, and there is never space for your head or feet when you need somewhere to put them. When you are not speaking, temporarily, to your fellow caravaner, due to their outrageous behaviour or neglect of your comforts, there is nothing to be done except turn your back to face the wall and pretend to go to sleep at 7 in the evening. Your clothes get damp, the cows and sheep wake you up by pushing the caravan about, the walls and ceiling leak rain and condensation, and every word you say, or whisper angrily, to your fellow caravaner inside the caravan, where you think you have privacy, can be heard by the other caravaners who are sitting about sociably outside, rather closer to your wheels and steps than a neighbour might consider normal. These caravans also have no indoor kitchen, so all the cooking and eating had to be done outside, in the cold, wet and windy English summer. I don’t know why they expected to eat off tables with tablecloths, while sitting in the turnip field, or under a hedge or in a ditch, but perhaps those were the standards below which these Edwardian ladies and gentlemen simply could not sink. The menu for the week appears to have been boiled potatoes with occasional sausages, and bacon and eggs for breakfast. They brought along a man to take care of the horses, but everything else was done by these gentry and nobles, not very well. The Baroness achieved unexpected popularity by making the coffee expertly and deliciously every day, but no-one else in the party seemed to have the slightest idea how to cook except the minister, and even he left the party after a few days, probably to get out of the Baron’s social-climbing clutches. As well as loathing the experience of caravans, the Baron’s disingenuous narrative style is very revealing, so revealing that we read with our mouths agape at the appalling attitudes and opinions with which he is favouring us, not quite sure that they can possibly be true. The account of how a proper German pastor would expect to be treated by the gentry on meeting them is quite horrible. His description of how a woman who dared to change her style of dress (in this case by shortening her skirts and wearing a tidy veil around her hair) would be treated by her German friends is simply cruel and humiliating bullying. Von Arnim carefully plans these episodes of self-exposure, since the Baron thinks he is the soul of correct and reasonable behaviour, while von Arnim has designed him to be an arrogant monster we will love to loathe. Even better, the Baron has many interesting ideas, expressed at length, about women, and wives, and politics, and the correct class rules, by which he digs his hole even deeper. The humour is all based on cultural difference, where the Baron is a caricature of the worst possible example of the cartoon Prussian soldier, pickelhaube and all, at whom the English are expected to laugh uproariously. Why did von Arnim do this? Timing is everything. This novel is one of many great, and even more really not at all great, examples of the anti-German war fever craze, an explosion of fervid literary production that lasted from about the 1880s to the beginning of the First World War, which predicted and were hysterical about the immense military power and preparedness of Germany, compared to Britain’s limp and ineffectual defences. It wasn’t a literary fashion led by anyone in particular: rather, it was a common assumption, a popular mob-rule idea, which fed on itself, and was encouraged by those with an interest in selling newspapers full of scare stories. It was also encouraged by those who wanted to push the British government into speeding up army reform, and the installation of lots of invasion defences, as well as the mobilisation of the Territorials into some kind of modern standing army, god forbid. Who ever thought we’d need something so extravagant? With this novel, von Arnim was simply cashing in on a literary fashion, and her novel is one of the better ones, one you can read with genuine enjoyment, rather than with the excuse that it’s interesting social history. The Caravaners is packed with outraged, but also rather pleased comments from the Baron about how weak, puny, unmilitary, inadequate and pathetic the Englishmen in the caravaning party are. They insist on serving the women first, on carrying water for the women, and generally fussing around after the women in a very unmanly fashion: this is of course proof that the English are ripe for conquest by good Germans. The joke is, of course, that these unmanly weaknesses are English good manners, which the Baron does not recognise, and this (in the eyes of the anglophone reader) makes him a philistine and a boor, and shows how excellent and admirable these Englishmen are. The strength of will and inexhaustible patience displayed by these Englishmen in the face of a week of the Baron’s dreadful behaviour also tells the reader just how splendid these chaps are, and what an oaf the Baron is. Surely no-one so stupid and self-deluding could possibly threaten our splendid army? And so on. 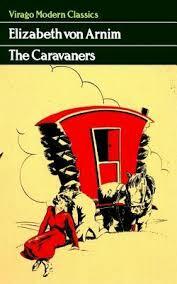 The Caravaners is a propaganda novel, published five years before the war began, and the propaganda is sweetened with the funniest jokes about the total failure of understanding between nations. It won’t offend anyone, because the Baron is such a caricature, and the Baroness is an absolute sweetie. Do read it, and I hope you laugh out loud.